Angiomyolipomas (AMLs) are the most common mesenchymal renal neoplasms and are classified as neoplasms of perivascular epithelioid cells (PEComa). AML is usually a benign neoplasm arising most often in the kidney although it has been described in a wide variety of sites. Most patients are adults, and one-third suffer from tuberous sclerosis. We describe a case of renal AML in a 54-year-old Bahraini woman who presented to the Bahrain Defence Force Hospital with right flank pain and hematuria, and who was known to have rheumatoid arthritis but had no cutaneous or other stigmata of tuberous sclerosis. It is the largest AML reported in Bahrain and is also striking for the fact that it contained an intratumoral aneurysm that ruptured causing symptoms leading to the radiological diagnosis of renal mass. Furthermore, the occurrence of an aneurysm in sporadic AML, as in our case, is rare since the large majority tend to be seen in association with tuberous sclerosis. Angiomyolipomas (AMLs) are the most common mesenchymal renal neoplasms and are classified as neoplasms of perivascular epithelioid cells (PEComa). They are observed in 0.1–0.22% of the general population and are four times more common in females.1 Two broad types have been described: sporadic isolated AML and AML associated with tuberous sclerosis. Approximately 80–90% of renal AML occur sporadically.2 Aneurysm formation is usually noted in AMLs associated with tuberous sclerosis and is rare in the sporadic variety.3 This report describes a case of aneurysm formation in a large, sporadic AML in a 54-year-old Bahraini woman. A 54-year-old woman presented to the Bahrain Defence Force Hospital, Riffa, Bahrain, with right flank pain and mild hematuria. She had rheumatoid arthritis, but there was no other significant medical history. 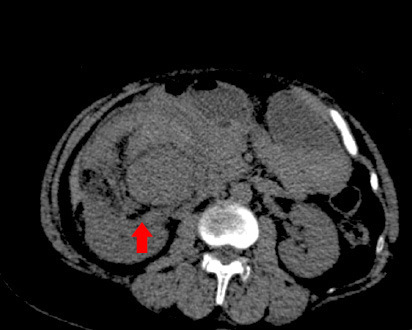 Pre-contrast computed tomography (CT), showed a mass in the anterior aspect of the right kidney measuring 11 cm in diameter. The mass was of mixed attenuation and predominantly soft tissue with a significant amount of fat. There was no calcification within the mass [Figure 1]. Figure 1: Computed tomography scan showing the tumor. Contrast CT demonstrated multiple enhanced tortuous dilated vessels within the mass, together measuring 44 mm in diameter, including definite aneurysmal dilatation and possible hemorrhage. The rest of the mass showed non-homogeneous faint enhancement, and there was fat stranding and fascial thickening especially around the lower part. 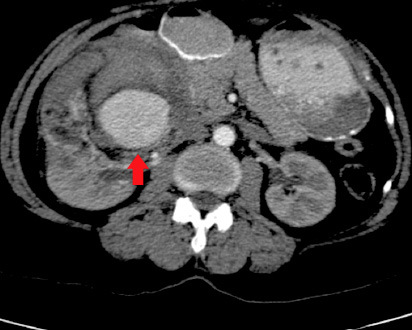 The renal mass displaced the inferior vena cava, there was no hydronephrosis on the right side, and no definite filling defects in the right renal vein [Figure 2]. Figure 2: Contrast computed tomography scan showing the aneurysm. Based on the clinical and radiologic findings, a presumptive diagnosis of AML of the right kidney was made. Laparoscopic right nephrectomy converted to open surgery was performed. There was a large mass measuring 13 × 12 × 8 cm bulging from the corticomedullary zone compressing the pelvis. The capsule overlying the tumor showed a hemorrhagic area. The renal artery and vein were not identified, and the adjacent kidney tissue showed a few cortical scars. No adrenal gland or lymph nodes were identified. The pelvis was compressed and grossly uninvolved by the tumor. 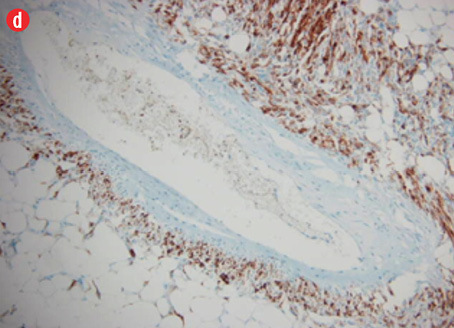 The resection specimen received in the histopathology laboratory is shown in Figure 3. The kidney measured 13 × 12 × 8 cm, and arising from the posteromedial aspect was a roughly spherical tumor measuring 10.5 cm in maximum dimension. The cut surface of the tumor was solid, tan-red, and displayed extensive areas of hemorrhage. Figure 3: Right kidney. (a) Mass arising from the posteromedial aspect, measuring 10.5 cm, stretching the capsule but not breaching it. (b) The cut surface of the mass was fleshy and tan-red, with extensive hemorrhage. Microscopic examination revealed a neoplasm composed of mature adipose tissue, blood vessels, and proliferations of smooth muscle cells [Figures 4a and b, and Figure 5]. 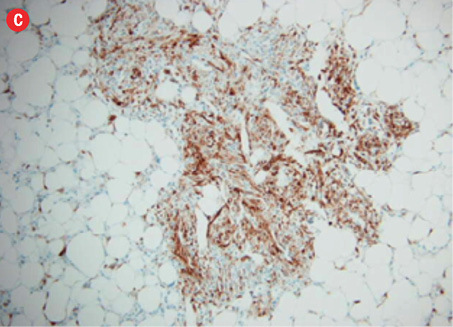 The neoplastic smooth muscle cells were mostly spindle-shaped, although in some areas (less than 5% of the sampled tissue; 20 blocks of tumor taken in all) the myoid cells were epithelioid-shaped [Figure 4b]. The cellular proliferation, both spindle and epithelioid, showed characteristic perivascular accentuation with positive staining for smooth muscle actin [Figure 4c] and HBM-45 protein [Figure 4d]. 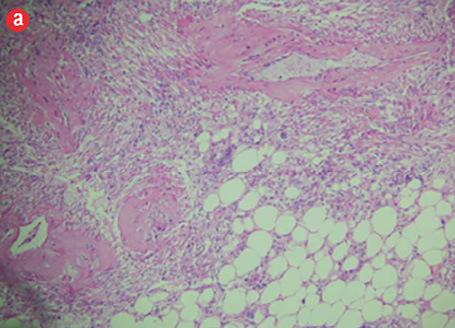 The blood vessels within the tumor showed irregular thickening and lacked elastic lamina. Aneurysmal dilatation and rupture was evident in one of the vessels, which measured 5 mm in diameter [Figure 5]. There was extensive hemorrhage with consequent areas of necrosis, but only minimal nuclear pleomorphism and no significant mitotic activity. The tumor-kidney interface was non-infiltrative, and there was no invasion of the capsule or renal pelvis. 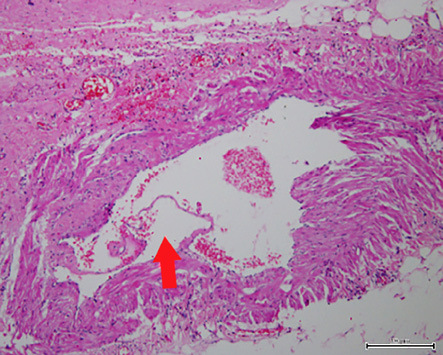 The adjacent kidney tissue showed mild inflammatory changes. A histological diagnosis of AML was confidently rendered. The patient was discharged five days after surgery with uneventful immediate post-surgical follow-up. 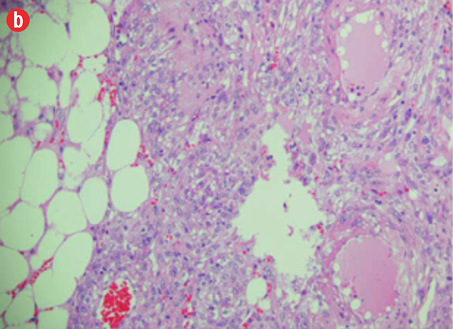 Figure 4: Hematoxylin and eosin staining revealed (a) the three components of angiomyolipoma: fat, blood vessels, and smooth muscle. The blood vessels showed irregular, thickened walls and spindled smooth muscle cells, magnification = 100 ×. (b) Epithelioid myoid cells between fat and vascular structures were visible, magnification = 250 ×. (c) Immunoperoxidase staining of myoid (smooth muscle cells) was positive for smooth muscle actin, magnification = 100 ×. (d) Perivascular myoid cells showed positive staining for HMB-45, magnification = 250 ×. Figure 5: Aneurysmal dilatation of blood vessel 5 mm in diameter. The red arrow shows focal disruption and lifting of the endothelium (hematoxylin and eosin stain, magnification = 250 ×). Aneurysm formation in AML is not uncommon, although the large majority occur in association with tuberous sclerosis. In a study that examined AML tumor size, aneurysm size and chance of rupture, aneurysms ranged from 2–7 mm in diameter and predictors of aneurysm rupture were a tumor size of 4 cm or more and an aneurysm diameter of 5 mm or more.7 The occurrence of an aneurysm in sporadic AML, such as the present case, is rare. A further interesting aspect of this case was the radiological appearance of the intratumoral aneurysm and the corresponding histological correlation. A 5 mm diameter ruptured aneurysm was identified in the tumor with associated extensive hemorrhage. It is very likely that the rupture led to symptoms of flank pain and hematuria prompting the patient to seek medical attention. We report the case of a patient with sporadic AML. The mass was the largest reported in Bahrain, to date, and was striking because it contained an intratumoral aneurysm that ruptured causing symptoms leading to the radiological diagnosis of renal mass. Furthermore, the occurrence of an aneurysm in sporadic AML is rare, as the large majority tend to be associated with tuberous sclerosis. 1. Fujii Y, Ajima J, Oka K, Tosaka A, Takehara Y. Benign renal tumors detected among healthy adults by abdominal ultrasonography. Eur Urol 1995;27(2):124-127. 2. Casper KA, Donnelly LF, Chen B, Bissler JJ. Tuberous sclerosis complex: renal imaging findings. Radiology 2002 Nov;225(2):451-456. 3. Patil AR, Chandra R, Gupta A, Thukral BB. Giant aneurysm formation in sporadic renal angiomyolipoma. J Radiol Case Rep 2010;4(6):21-27. 4. Martignoni G, Pea M, Reghellin D, Zamboni G, Bonetti F. PEComas: the past, the present and the future. Virchows Arch 2008 Feb;452(2):119-132. 5. Mete O, van der Kwast TH. Epithelioid angiomyolipoma: a morphologically distinct variant that mimics a variety of intra-abdominal neoplasms. Arch Pathol Lab Med 2011 May;135(5):665-670. 6. Brimo F, Robinson B, Guo C, Zhou M, Latour M, Epstein JI. Renal epithelioid angiomyolipoma with atypia: a series of 40 cases with emphasis on clinicopathologic prognostic indicators of malignancy. Am J Surg Pathol 2010 May;34(5):715-722. 7. Yamakado K, Tanaka N, Nakagawa T, Kobayashi S, Yanagawa M, Takeda K. Renal angiomyolipoma: relationships between tumor size, aneurysm formation, and rupture. Radiology 2002 Oct;225(1):78-82. 8.JJinzaki M, Silverman SG, Akita H, et al. Renal angiomyolipoma; a radiological classification and update on recent developments in diagnosis and management. Abdom Imaging 2014 Jun;39(3):588-604. Helenon O, Merran S, Paraf F, et al. 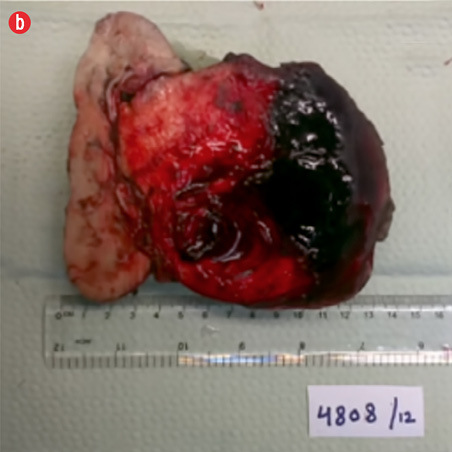 Unusual fat-containing tumors of the kidney: a diagnostic dilemma. Radiographics 1997;17:129-144. Strotzer M, Lehner K, Becker K. Detection of fat in a renal cell carcinoma mimicking angiomyolipoma. Radiology 1993;188:427-428. Kim JY, Kim JK, Kim N, Cho KS. CT histogram analysis: differentiation of angiomyolipoma without visible fat from renal cell carcinoma at CT imaging. Radiology 2008 Feb;246(2):472-479. 12.PPrando A. Intratumoral fat in a renal cell carcinoma. Am J Roentgenol 1991;156:871a. 9. Taneja R, Singh DV. 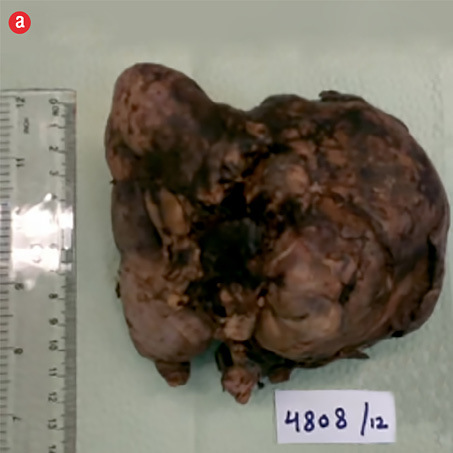 Giant renal angiomyolipoma: unusual cause of huge abdominal mass. J Clin Imaging Sci 2013;3:56.